Chocolate eclairs have been around in France since the mid-19th century. The name 'eclair' means 'flash', as in flash of lightning, which is about the amount of time it takes to eat one of these choux pastry, cream and chocolate treats. Preheat your oven to 180° C (356° F) for a fan oven, 200° C(392° F) conventional, gas 6. Put the water, butter and salt in a small saucepan and heat gently until the butter has melted. Then bring it to the boil, add the flour all at once, remove from the heat and beat vigorously to incorporate the flour. Return it to the stove on low heat, cook for a minute, stirring all the time until the dough is smooth and glossy. Tip it out into a bowl and allow to cool until tepid. Now add an egg and beat it until it's fully incorporated, then repeat with the other egg. Cut a piece of greaseproof paper to fit a baking tray. Smear butter all over one side, then quickly run it under cold water - this will help generate some steam buring baking. Pipe 10cm (4 inch) lengths of dough onto the tray - they should be quite wide and thick. Bake for 15 minutes, then reduce the heat to 150° C (302° F) for a fan oven, 170° C(338° F) conventional, gas 3 and bake for another 10-15 minutes until golden and crisp. Remove from the oven, prick each eclair with a pin to let the steam escape, and place on a wire rack to cool down completely. Whip the cream to soft peaks, then beat in the sugar and vanilla extract. To fill the eclairs, there's the easy way, just slit the side and spoon cream in. Or the more difficult but professional-looking way, inject it with a flavour injector (syringe). Break your chocolate into squares and put all but 4 of them into a bowl. Microwave on full heat for 30 seconds. Stir the chocolate, then give it more blasts of 20 seconds each, stirring the chocolate between each one. It might take 4-5 blasts to melt all of the chocolate. When it is all melted, stir in the 4 whole pieces and keep stirring until they have melted - this is a quick and easy way to temper the chocolate and make it shiny, not dull. 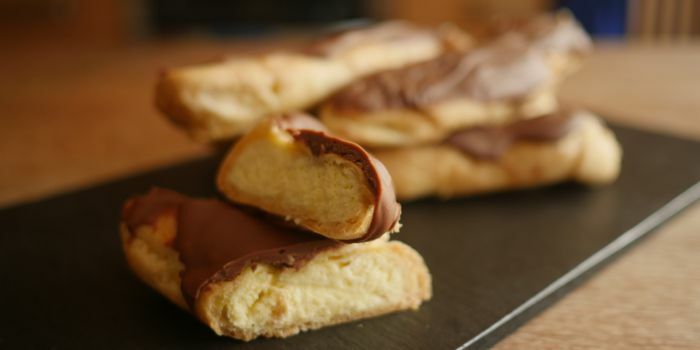 Dip the top of each filled eclair into the chocolate - try not to spread it or mess about with it in any way or you'll get ridges in the chocolate. The video above is from the Keef Cooks YouTube channel. Click here to see the video recipe of Chocolate Eclairs on YouTube.